Background: Oblique subcostal transversus abdominis plane block (OSTAP) is a recently described regional anesthetic technique used in upper abdominal surgeries such as laparoscopic cholecystectomy (LC). Erector spinae plane block (ESPB) has also been reported for postoperative analgesia in LC. Aim: We aimed to compare the effectiveness of OSTAP and ESPB in providing postoperative analgesia in patients undergoing these surgeries. Setting and Design: This study was designed as a double-blinded, prospective, randomized, efficiency study in a tertiary university hospital, postoperative recovery room, and ward. Materials and Methods: A total of 72 patients were recruited and 60 patients were randomized into three equal groups (ESPB, OSTAP, and control group). Pain intensity between groups was compared using Numeric Rating Scale (NRS) scores. In addition, consumption of paracetamol and tramadol and additional rescue analgesic requirement were measured. Standard multimodal analgesia was performed in all groups, while ESPB block was also performed in Group ESPB and OSTAP block was also performed in group OSTAP. Statistical Analysis Used: Descriptive statistics were expressed as mean ± standard deviation. Independent t-test, Mann–Whitney U-test, Chi-square test, Fisher's exact test, Shapiro–Wilk test, one-way ANOVA, and post hoc Tukey's analysis were used for statistical analysis. 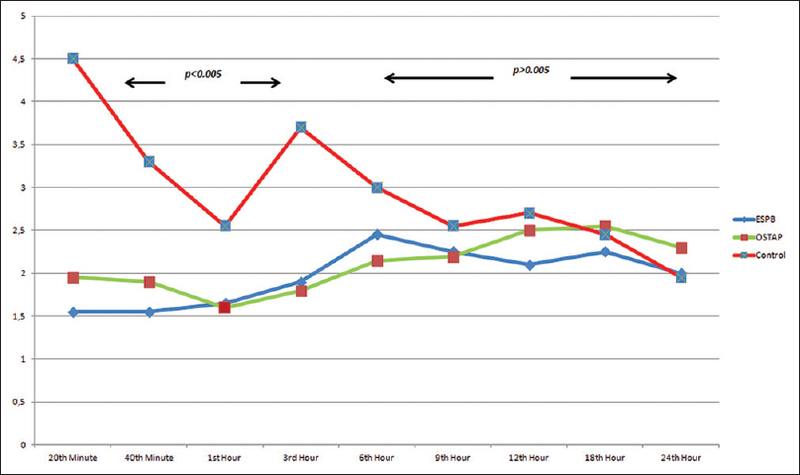 Results: NRS was lower in block groups during the first 3 h. There was no difference in NRS scores at other hours. Analgesic consumption and rescue analgesic requirement were lower in groups ESPB and OSTAP when compared to those of control group. Block groups were similar. Conclusion: Bilateral ultrasound-guided ESPB and OSTAP performed at the end of LC lead to akin analgesia requirement and improve the quality of multimodal analgesia. Interfascial plane blocks – regional anesthetic techniques first described with anatomical landmarks and pop-up – have become safer and easier to perform with the use of ultrasonography. Ultrasound guidance and anatomic studies have led to the description of many new interfascial plane blocks. While there are now many regional anesthetic techniques for use in thoracic and abdominal procedures, very few of these techniques are appropriate for postoperative analgesia in laparoscopic cholecystectomy (LC). LC leads to somatic pain from the supraumbilical abdominal area and also visceral pain due to pneumoperitoneum and surgical manipulation. In this study, we aimed to compare the effect of ESPB and OSTAP on postoperative analgesia requirement and pain scores in patients undergoing LC. This single-blinded, prospective, randomized, efficiency study was performed after Local Ethics Committee approval (No: 2018.08/021, August 2018) and in accordance with the principles outlined in the Declaration of Helsinki. The study was registered with clinicaltrials.gov (Registration No: NCT03508531), and CONSORT checklist was used for enrollment and allocation of patients [Figure 1]. Recruitment was performed between March 2018 and May 2018. All patients gave written informed consent for inclusion into this study. Patients aged 18–65 years with an American Society of Anesthesiologists (ASA) physical status classes of I and II who were scheduled to undergo elective LC were included in this study. Patients who refused enrollment or were unable to provide informed consent, had contraindications to or a known allergy to regional anesthesia, those with bleeding diathesis, use of anticoagulants, presence of severe kidney or liver disease or psychiatric disorders, or a history of previous upper gastrointestinal surgery were excluded from the study. The study was designed to include three groups of twenty patients each. Patients in Group C (Control group) received our institute's standard analgesia plan with no block. Patients in Group ESPB and Group OSTAP received the same standard analgesia plan and also underwent ESPB and OSTAP blocks, respectively. The sealed envelope technique was used to randomize patients into groups. Randomization and blocks were performed by the same anesthesiologist (ST) who was not involved in data collection or analysis. Recovery room and ward follow-up was performed by medical staff who were blinded to which group the patient was in. Premedication, general anesthesia induction, and maintenance were the same for all patients. Standard monitoring procedures included pulse oximetry, electrocardiography, and noninvasive arterial pressure prior to anesthetic induction. All patients were premedicated with intravenous (i.v.) midazolam 1–2 mg and antibiotic prophylaxis, according to the hospital's protocol. Induction was performed using propofol 2–3 mg/kg, fentanyl 100 μg, and rocuronium bromide 0.6 mg/kg. 0.6 minimum alveolar concentration sevoflurane and 0.08 μg/kg/min remifentanil infusion was used for anesthetic maintenance. Remifentanil dosage was adjusted according to hemodynamic parameters, up to 2 μg/kg/min. No local anesthesia was used for surgical sites, nor was it applied by intraperitoneal nebulization. Pneumoperitoneum was evacuated in all patients at the end of surgery. After completion of surgery and blocks, the patients were extubated and transferred to the postoperative recovery room. All blocks were performed under general anesthesia under sterile conditions following the completion of LC. All blocks were performed under ultrasonographic guidance using a convex or linear ultrasound probe (Mindray DP 9900 plus; Mindray Bio-Medical Electronics, Shenzhen, China). LA mixture included 20 mL of bupivacaine 0.5%, 10 mL of lidocaine 2% and 10 mL of normal saline to make a mixture totaling 40 mL. 20 mL of this mixture was applied to each side. Patients were placed on their left side so that their right side was superior. The linear ultrasound transducer was placed in a longitudinal parasagittal orientation 2.5–3 cm lateral to the T9 spinous process. The erector spinae muscles were identified superficial to the tip of the T9 transverse process. A 21G 10-cm needle (Stimuplex A, B Braun, Melsungen, Germany) was inserted using an out-of-plane approach. The tip of the needle was placed into the fascial plane on the deep (anterior) aspect of the erector spinae muscle. The location of the needle tip was confirmed by visible fluid spread lifting the erector spinae muscle off the bony shadow of the transverse process on ultrasonographic imaging. A volume of 20 mL of LA mixture was injected. Due to reports that ESPB blocks visceral pain especially that of peritoneal distention, and as at least one trocar is placed in the midline, the same procedure was repeated for the opposite side. Probe position and sonographic view are shown in [Figure 2]. Blocks were performed in the supine position using a high-frequency linear transducer with the in-plane technique. The transducer was placed immediately below the costal margin on the oblique plane. The rectus abdominis, transverse abdominis, and internal oblique and external oblique muscles were identified. A 21G 10-cm needle (Stimuplex A, B Braun, Melsungen, Germany) was inserted using an in-plane approach from medially to laterally. 20 mL of LA was applied between the fascia immediately above the rectus abdominis muscle. The same procedure was applied bilaterally. The same volume and mixture of LA was performed, as described previously for ESPB. Probe position and sonographic view are shown in [Figure 3]. Perioperatively, all patients received 1 g paracetamol and 20 mg tenoxicam. During the postoperative period, fentanyl 25 μg was applied if Numeric Rating Scale score (NRS) >3/10 in the recovery room. Thereafter, basal infusion-free tramadol PCA (3 mg/ml, 10 mg bolus, lockout time 20 min) was programmed and scheduled with 1 g paracetamol i.v. every 8 h. Paracetamol dose was skipped if NRS <2 and/or patient refused. When required, diclofenac Na IM 75 mg was performed as rescue analgesia if NRS >3/10. Postoperative pain was evaluated using the NRS. The NRS is a segmented numeric version of the Visual Analog Scale (VAS) in which a respondent selects a whole number (0–10 integers) that best reflects the intensity of his/her pain. It is considered a one-dimensional measure of pain intensity in adults. The 11-point numeric scale ranges from “0” representing one pain extreme (“no pain”) to “10” representing the other pain extreme (“pain as bad as you can imagine” or “worst pain imaginable”). Changes in NRS at rest and on movement were recorded at intervals. Outcome measures were NRS pain scores at the 20th and 40th min as well as at the 1st, 3rd, 6th, 9th, 12th, 18th, and 24th h both at rest and when coughing and postoperative analgesia requirements (paracetamol, tramadol, and rescue analgesics). In addition to the above measures, shoulder pain during the first 24 h and presence of postoperative nausea and vomiting were noted. The severity of nausea was assessed by patients on a 4-point scale (none, mild, moderate, and severe). Nurses noted any incidence of vomiting in the recovery room or in the ward. Finally, the number of patients receiving ondansetron was recorded. There are no previous clinical studies comparing ESPB and OSTAP for postoperative analgesia in any surgical procedure. We used a power of 0.90 and significance level of 0.05 to calculate a sample size of 18 patients for three groups when compared with ANOVA. Considering the possibility of dropouts, we designed the study to include twenty patients for each group, totaling sixty patients. Statistical Package for the Social Sciences version 16.0 statistical package program (SPSS Inc., Chicago, IL, USA) was used for statistical analysis. All analyses were performed by a single author (DTT) who was blinded to the groups. Descriptive statistics were expressed as mean ± standard deviation. For univariate analysis f of means between groups a 2-sample, independent t-test assuming equal variances was used. For data without normal distribution, Mann–Whitney U-test was performed. Ratios were compared using Chi-square test. Categorical variables were compared using Fisher's exact test. Continuous variables were tested for normality via the Shapiro–Wilk test. One-way ANOVA was used to compare average NRS scores and tramadol consumption between groups. Post hoc Tukey's analysis was performed to determine differences between groups, when ANOVA revealed a significant difference. P < 0.05 was considered statistically significant. For NRS scores, Bonferroni correction was applied, and statistical significance was accepted as P < 0.005, for measurements from ten time points. NRS was also analyzed using repeated measures analysis. Seventy-two patients scheduled to undergo LC were evaluated for inclusion in this study. Two patients were excluded for bleeding diathesis, seven for previous abdominal surgery, and three due to psychiatric disorders. Descriptives of each group are provided in [Table 1]. Average age, male-to-female ratio, ASA scores, average surgical time, and body mass index were similar in all groups. There was no statistical difference between block performing time for ESPB and OSTAP groups. All blocks were performed smoothly with no block-related complications (bleeding, emphysema, pneumothorax, LA toxicity, etc.) observed in the study. Nausea requiring ondansetron was observed in two patients in Group C, one in group ESPB, and none in group OSTAP. Right shoulder pain was seen in three patients in Group C, two in group OSTAP, and none in group ESPB. NRS scores at rest and when coughing for each group are shown in [Table 2], [Table 3] and [Figure 4], [Figure 5], respectively. When average NRS scores for 24 h were compared between groups, no statistically significant difference was found (P > 0.05). There was a statistically significant difference at the 20th min, 40th min, 1st h, and 3rd h NRS scores at rest and coughing (P < 0.005 and P < 0.005, respectively; post hoc comparison between control group vs. ESPB and control group vs. OSTAP at the 20th min: P < 0.001 and P = 0.002, 40th min: P < 0.001 vs. P = 0.004, 1st h: P < 0.001 and P = 0.002, and 3rd h P < 0.001 and P < 0.001, respectively). No difference was found between the two block groups (P > 0.005). Statistical evaluation was same for NRS score on coughing. We compared the average NRS scores during various time frames. While there was a statistically significant difference between NRS for the 0–3-h time frame (average NRS in ESPB: 1 ± 1.10, OSTAP 1.27 ± 1.41, and control 2.95 ± 1.81; P < 0.001), there was no statistically significant difference for 3–12-h and 12–24-h time frames (P > 0.05). Analgesic requirements are shown in [Table 3]. Fentanyl was administered to 11 patients in Group C, five in group ESPB, and six in group OSTAP (P > 0.05). Average paracetamol requirement during the first 24 h was 2.80 ± 0.41 g in Group C, 2.30 ± 0.86 g in group ESPB, and 2.25 ± 0.72 g in Group OSTAP (P < 0.05). 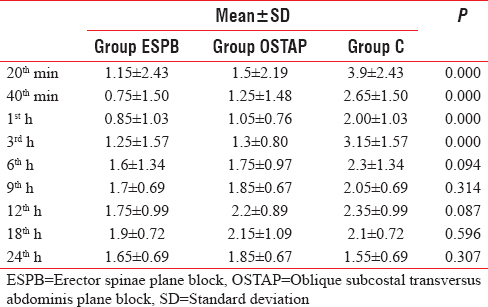 Post hoc analysis revealed a difference between Group C versus group ESPB and Group C versus OSTAP (P < 0.05 and P < 0.05, respectively), whereas there was no difference between group ESPB and group OSTAP (P > 0.05) [Table 4]. [Table 4] shows the tramadol consumption for the first 12 h and second 12 h postoperatively. Tramadol consumption was statistically different between groups during the first 12 h (P < 0.05), but similar during the second 12 h (P > 0.05). Post hoc analysis demonstrated that tramadol consumption was similar between two block groups at the first 12 h (P > 0.05), but lower in both block groups when compared to the control group during this time frame (comparison between control group vs. ESPB and control group vs., OSTAP at the first 12 h P < 0.05 and P < 0.05, respectively). Tramadol consumption through PCA was statistically significantly different between these groups. [Table 3] demonstrates the tramadol consumption for the first 12 h and second 12 h. Tramadol consumptions were significantly different for the first 12 h (P < 0.05). In post hoc analyses, the first 12 h tramadol consumption was similar between the two block groups (P > 0.05), but significantly higher in the controls when compared to both block groups (comparison between control group vs., ESPB and control group vs. OSTAP at the first 12 h; P < 0.05 and P < 0.05, respectively). There was no difference between groups for tramadol consumption at the second 12 h.
The number of patients requiring rescue analgesia during the first 12 h was three in group ESPB, four in group OSTAP, and 11 in Group C (P < 0.05). This difference was statistically significant at post hoc analysis between Group C and both block groups (P < 0.01 and P < 0.01, respectively). 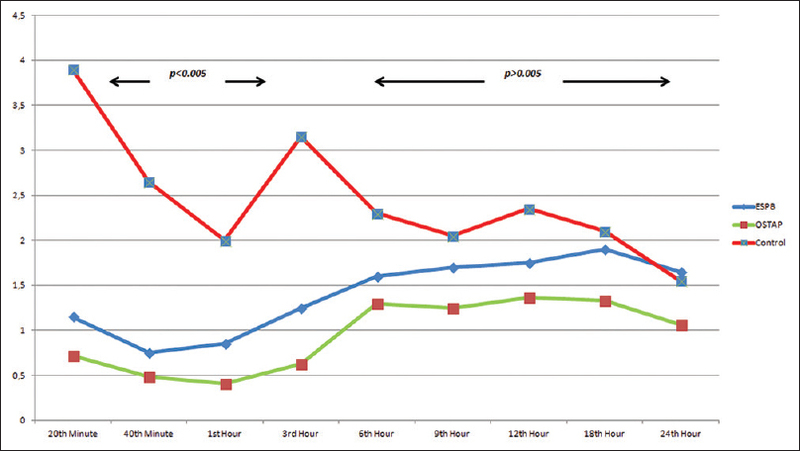 Rescue analgesia requirement was similar for the second 12 h (P > 0.05) [Table 5]. Our study has shown that ultrasound-guided bilateral single-shot ESPB and bilateral single-shot OSTAP performed at the end of the surgery in LC patients significantly lowered NRS at rest and coughing/movement in the first 3 h and led to less analgesic agent requirement in the first 24 h when compared to a control group where no block was performed. Our NRS scores were higher in the control group when compared to those in block groups in the first 3 h. This is probably due to the time it takes for tramadol to reach effective plasma concentrations. While the difference mentioned was statistically significant, it is not clinically significant as the average NRS scores were <4 for all groups at all times. Postoperative pain after LC has two causes. The first is visceral pain due to the trauma of gallbladder resection, peritoneal CO2 exposure, and stretching, and the second is somatic pain caused by skin incision. Therefore, any analgesic protocol after LC must be effective on both sources of pain. We previously reported the effect of ESPB on postoperative pain and analgesia requirement, in a randomized controlled trial of LC patients. 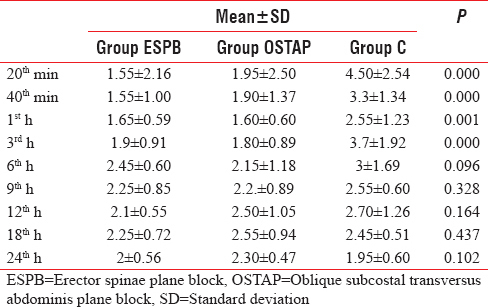 In this study, ESPB was performed preoperatively under sedoanalgesia from the 9th thoracic vertebral level with 20 mL 0.375% concentration of bupivacaine as LA. We demonstrated that ultrasound-guided bilateral single-shot ESPB performed before general anesthetic induction in LC patients significantly lowered NRS at rest in the first 3 h and led to less analgesia requirement in the first 24 h when compared to a control group. In the current study, we performed blocks after completion of the surgical procedure so that remifentanil doses would be similar between groups, and therefore not effect our outcome measures therefore not effect our outcome measures. In the current study, we used a lower concentration of bupivacaine and performed blocks at the end of the surgical procedure versus a higher concentration of bupivacaine and block preoperatively. The results in our present study are similar to our previous one demonstrating that lower concentrations of LA and performing the block after completion of surgery offer similar outcomes. There are no similar studies of ESPB in LC. The ideal concentration of LA for ESPB in thoracic and abdominal surgeries has yet to be determined. In a mini-review, 3.6 mL of LA per vertebral level was reported to be adequate in ESPB. However, LA distribution at different thoracic or lumbar vertebral levels may differ, leading to clinicians to determine LA volume according to patients' age and type of surgery to be performed.,,, Although reports and clinical experience may differ, 20 mL of LA applied at T4 has been shown to spread caudal and cephalad for three to seven vertebral levels. This study has also demonstrated that OSTAP is just as effective as ESPB, also leading to effective analgesia in our group of patients. There are a few studies reporting similar results.,,, In a study reporting sensorial block distribution and effect time in OSTAP, the authors reported blockage of at least T7–T12 dermatomes, leading to sensorial blockage of the mid-abdomen and spreading partially to the lateral abdomen for at least 10 h. This sensorial distribution seems adequate for the incisions performed on the anterior side of the abdomen in LC. Has this study been able to determine a difference of effect of postoperative pain and analgesia requirements between ESPB – a modality that is thought to have a high rate of effect on visceral pain, OSTAP – a modality where there is limited evidence of its effect on visceral pain? Our results have shown no such difference and that ESPB and OSTAP have similar effect. The severity and time of visceral pain is dependent on surgical procedure time, insufflation pressure and time, as well as the complete or partial evacuation of pneumoperitoneum. Maybe the answer posed at the beginning of this paragraph will better be answered through randomized controlled trials involving procedures that last longer and therefore have longer insufflation time, such as laparoscopic bariatric procedures. This report is the first controlled study to compare the fairly new and rarely reported thoracic ESPB with a different regional anesthetic technique. Our study has several limitations. The first and most important limitation is that no data were collected to assess the sensorial coverage of ESPB and OSTAP. We, therefore, may have missed some block failures. A suitable and inclusive multimodal analgesia regime led to adequate analgesia in all of our patients. Another limitation was all blocks were performed under general anesthesia after completion of the surgical procedure. The rationale behind this was explained previously, in the methods' section of this report. In nearly all studies of regional anesthetic techniques, pure LA or LA diluted with normal saline is used. We added lidocaine to our LA mixture as we required low onset time, as blocks were performed at the end of surgery. It was important that block effect began during the time from when the patient was extubated and transferred into the recovery room. Studies evaluating regional anesthetic techniques generally use morphine consumption as a comparison. Although we had no reason for not using morphine PCA, tramadol has been shown to have the same effect as morphine in patients undergoing LC. Our sample size was calculated for the minimum number of patients required to find a statistically significant difference in our results. It was not large enough to determine block-related complications such as nausea and vomiting. Bilateral ultrasound-guided ESPB and OSTAP performed at the end of LC lead to decreased first 24 h analgesia requirement and improve the quality of multimodal analgesia when compared to a control group. Further studies are required to determine the effect, feasibility, and ideal volume and concentration and to determine the cause of effect of ESPB and OSTAP. Elsharkawy H, Pawa A, Mariano ER. Interfascial plane blocks: Back to basics. Reg Anesth Pain Med 2018;43:341-6. Tulgar S, Selvi O, Kapakli MS. Erector spinae plane block for different laparoscopic abdominal surgeries: Case series. Case Rep Anesthesiol 2018;2018:3947281. Breazu CM, Ciobanu L, Hadade A, Bartos A, Mitre C, Mircea PA, et al. 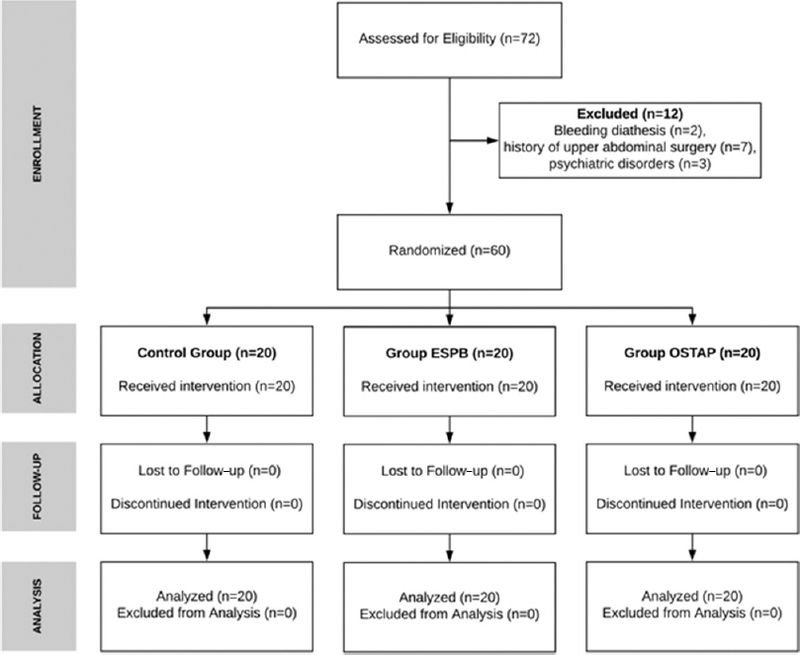 The efficacy of oblique subcostal transversus abdominis plane block in laparoscopic cholecystectomy – A prospective, placebo controlled study. Rom J Anaesth Intensive Care 2016;23:12-8. Shin HJ, Oh AY, Baik JS, Kim JH, Han SH, Hwang JW, et al. Ultrasound-guided oblique subcostal transversus abdominis plane block for analgesia after laparoscopic cholecystectomy: A randomized, controlled, observer-blinded study. Minerva Anestesiol 2014;80:185-93. Hebbard P. Subcostal transversus abdominis plane block under ultrasound guidance. Anesth Analg 2008;106:674-5. Tulgar S, Kapakli MS, Senturk O, Selvi O, Serifsoy TE, Ozer Z, et al. Evaluation of ultrasound-guided erector spinae plane block for postoperative analgesia in laparoscopic cholecystectomy: A prospective, randomized, controlled clinical trial. J Clin Anesth 2018;49:101-6. Adhikary SD, Bernard S, Lopez H, Chin KJ. Erector spinae plane block versus retrolaminar block: A magnetic resonance imaging and anatomical study. Reg Anesth Pain Med 2018;43:756-62. Chin KJ, Adhikary S, Sarwani N, Forero M. The analgesic efficacy of pre-operative bilateral erector spinae plane (ESP) blocks in patients having ventral hernia repair. Anaesthesia 2017;72:452-60. Chin KJ, Malhas L, Perlas A. The erector spinae plane block provides visceral abdominal analgesia in bariatric surgery: A report of 3 cases. Reg Anesth Pain Med 2017;42:372-6. Restrepo-Garces CE, Chin KJ, Suarez P, Diaz A. Bilateral continuous erector spinae plane block contributes to effective postoperative analgesia after major open abdominal surgery: A case report. A A Case Rep 2017;9:319-21. Kashani HH, Grocott HP. Clarity needed as to the optimal dose and volume of local anesthetic for erector spinae plane blockade for posterior rib fractures. Am J Emerg Med 2018;36:1102-3. De Cassai A, Tonetti T. Local anesthetic spread during erector spinae plane block. J Clin Anesth 2018;48:60-1. Kose HC, Kose SG, Thomas DT. Lumbar versus thoracic erector spinae plane block: Similar nomenclature, different mechanism of action. J Clin Anesth 2018;48:1. Ahiskalioglu A, Alici HA, Ari MA. Ultrasound guided low thoracic erector spinae plane block for management of acute herpes zoster. J Clin Anesth 2017;45:60-1. Ivanusic J, Konishi Y, Barrington MJ. A cadaveric study investigating the mechanism of action of erector spinae blockade. Reg Anesth Pain Med 2018;43:567-71. Aydın T, Balaban O, Acar A. Ultrasound guided continuous erector spinae plane block for pain management in pulmonary malignancy. J Clin Anesth 2018;46:63-4. Vidal E, Giménez H, Forero M, Fajardo M. Erector spinae plane block: A cadaver study to determine its mechanism of action. Rev Esp Anestesiol Reanim 2018;65:514-9. Basaran B, Basaran A, Kozanhan B, Kasdogan E, Eryilmaz MA, Ozmen S, et al. Analgesia and respiratory function after laparoscopic cholecystectomy in patients receiving ultrasound-guided bilateral oblique subcostal transversus abdominis plane block: A randomized double-blind study. Med Sci Monit 2015;21:1304-12. Ramkiran S, Jacob M, Honwad M, Vivekanand D, Krishnakumar M, Patrikar S, et al. Ultrasound-guided combined fascial plane blocks as an intervention for pain management after laparoscopic cholecystectomy: A randomized control study. Anesth Essays Res 2018;12:16-23. Chen Y, Shi K, Xia Y, Zhang X, Papadimos TJ, Xu X, et al. Sensory assessment and regression rate of bilateral oblique subcostal transversus abdominis plane block in volunteers. Reg Anesth Pain Med 2018;43:174-9. Aksu C, Gürkan Y. Ultrasound-guided bilateral erector spinae plane block could provide effective postoperative analgesia in laparoscopic cholecystectomy in paediatric patients. Anaesth Crit Care Pain Med 2019;38:87-8. Naguib M, Seraj M, Attia M, Samarkandi AH, Seet M, Jaroudi R, et al. Perioperative antinociceptive effects of tramadol. A prospective, randomized, double-blind comparison with morphine. Can J Anaesth 1998;45:1168-75.